Our friends at Max2Play have created a very cool project with a Raspberry Pi, the official 7+ touchscreen, and a HiFiBerry DAC+. (They used the DAC+ light, but the project will work with all HiFiBerry cards.) 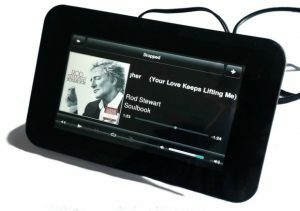 It looks even better than the original Logitech Squeezebox! While it needs some drilling, it’s relatively easy to build. Check out their guide on Instructables.